We’ve been baking here at the school with several brands, but Mulino Marino flours for about seven years. I finally got around to visiting the mill in Northern Italy, in the summer of 2017 with a view to finding out more about Italian flours in general. I can’t tell you what a treat to actually sit and chat about the flour in the shop surrounded by shelves stacked with bags in the mill shop. My trip co incited with an open day and I ended up serving a couple of Italian customers and advising them on what flour they needed in Italian, luckily I’d Fausto gave me a great insight into how the different Italian flours relate to each other, and to their UK equivalents so I felt pretty confident in my answers, even if my Italian grammar needed some improvement. So I had been chatting to Fausto on the phone for a number of years whenever I needed to know more about a particular flour, and as third generation miller he really knows his flour. 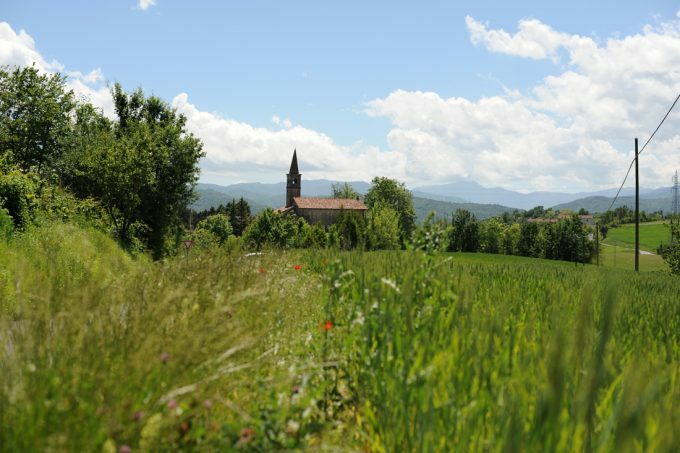 His grandfather started the mill and he has a wealth of experience and knowledge on everything from where and how the grain is grown, to the best uses for each of the wide range of flours produced at Mulino Marino. It’s a family business and his cousin, brother and father also run the mill, along with a staff from the local community. It is a gorgeous, warm family run business, and much of the grain the buy is from farmers they have been working with for decades. Fausto began by telling me how the grain is carefully cleaned and checked prior to milling. They use an optical sorting machine, which has infra-red cameras to detect the smallest of defects in any single grain. Any grains that don’t pass the test are rejected and used in animal feed. The grain is then washed very slowly, adding as little water as possible, before being allowed to rest for a period, during which time the enzymes just start to react. The length of this conditioning period depends on the type of grain – spelt is given 12 hours, while Manitoba wheat is left for 48 hours. In general, the higher the protein level, the longer the conditioning required. White rye being bagged up. 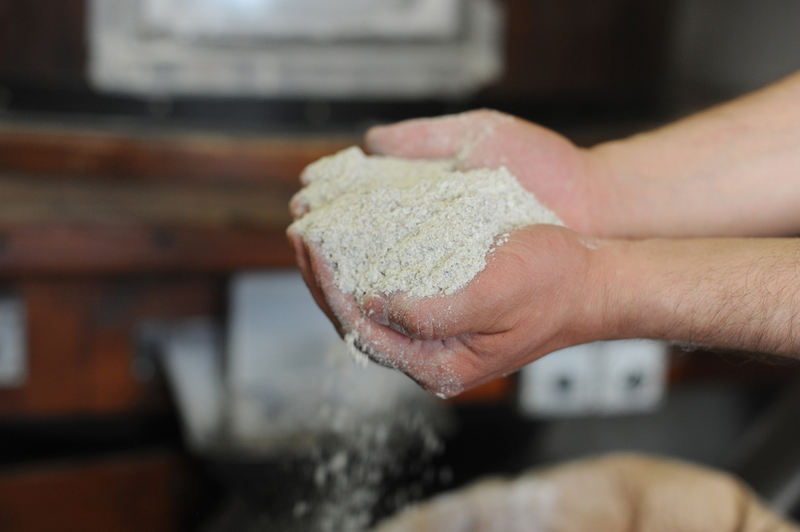 The stoneground flours produced at Mulino Marino are milled using ancient millstones that have been carefully hand dressed, each one tailored to the characteristics of a particular grain. Roller milling is only used for the most finely milled flours, and the flour is milled carefully to avoid overheating the flour and destroying heat sensitive nutrients. Similarly to French flour, Italian flours are classified by ash content, which is a measure of their mineral content. Fausto explained that things have changed in the past decade as low ash content was often considered desirable, as it indicated a highly refined and pure flour in bakers minds. But artisan bakers have returned to favouring flours with a higher ash content because these produce more flavoursome breads and are more nutritious. The ash content is lower in the more finely milled flours because most of the minerals are found in the aleurone layer, more of which is removed in highly refined flours. So the lower the ash the less of the outer lay of the wheat is in the flour. Fausto and I began by talking about farina integrale, or wholegrain flour. This is a coarse flour, containing the entire grain. At Mulino Marino they mill farina integrale from wheat, spelt (farina integrale di farro) and rye (farina integrale di segale). As with English whole wheat flour that we are perhaps more familiar with, when used alone these flours produce a fairly dense loaf, but they are ideal for blending with white flours for a lighter loaf that has lots of flavour, and more nutrition. How is Italian flour graded? Most bakers in the UK will be familiar with the idea of using different flours for different purposes. We are used to reaching for a bag of plain flour when we want to make pastry and scones, and strong bread flour for baking loaves and rolls. But when it comes to the classification systems used by other countries, there can be some confusion. It isn’t always obvious how the flours we are used to working with relate to the different American, French of Italian flours. 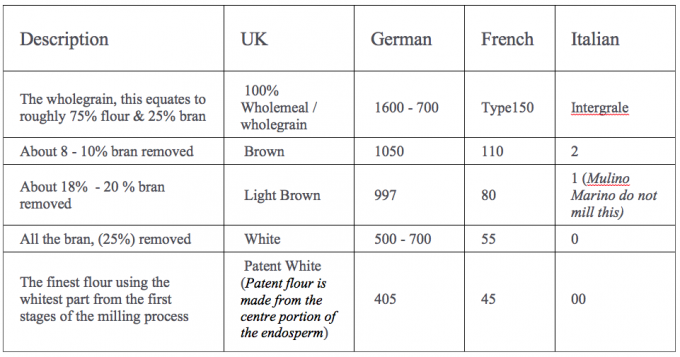 An over view of UK, German, French & Italian Flour. Italian flour is graded on a scale from 00 (the finest) through to 2 (a coarser flour), with integrale being the coarsest flour. Both grano duro (hard wheat) and grano tenero (soft wheat) are used to produce flours of different grades. Flours milled from grano duro are recommended for making pasta and some breads, especially those associated with the southern regions of Italy. Grano tenero flours are generally used in Italy to make both bread and pastries. Typo 2 (type 2) flour is high in bran, and still slightly coarse. Fausto explains that at Mulino Marino they mill different kinds of flour as type 2. Their buratto flour, the pan di sempre, sfarinato di grano duro, farro bianco and segale bianca are all type 2 flours. These flours are bet expalned to the UK bakers as basically lighter wholemeal flours – a wholemeal from which about 20% of the bran has been removed. 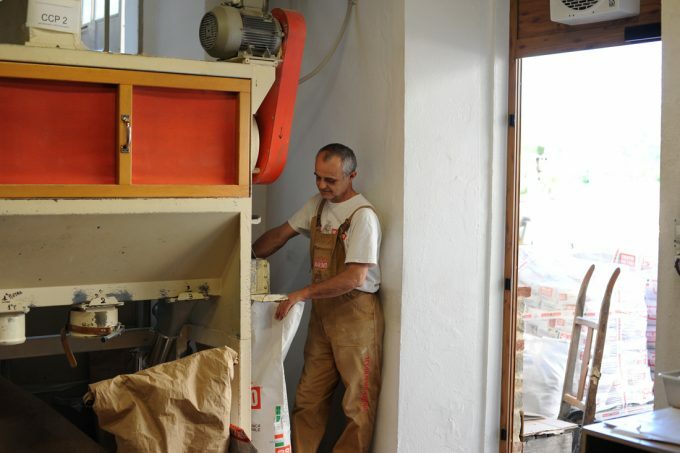 The type 2 flours are all stoneground because, Fausto tells me, “the freshness, the taste, the aromas that come out are better with stoneground.” Stone milling leaves all of the germ, which is not possible with roller milling. I love this attention to detail, using a range of traditional stones, specifically dressed for each grain, to produce flours that are more delicious, fatty, rich and nutritious. These flours make really delicious sourdough bread – nutritious, but lighter than a 100% wholemeal. Type 1 flour, has a finer texture than the type 2, but is still about half and half wholemeal and white. Mulino Marino doesn’t produce any type 1 flours. From the type 2, they jump straight to the 0 and then the 00 flours. These two types of flour are often used for bread making, but can be substituted for plain flour in just about any recipe. The type 0 flours are a good all-purpose option. In France these flours are called 55 or standard bread flour. They contain about 25% bran and make a nice, extensible dough and bread with a lovely open crumb. The Mulino Marino Manitoba is a type 0 flour. Fausto explained that the difference between the 0 and 00 flours is largely in the blend of grains that are used to produce them. 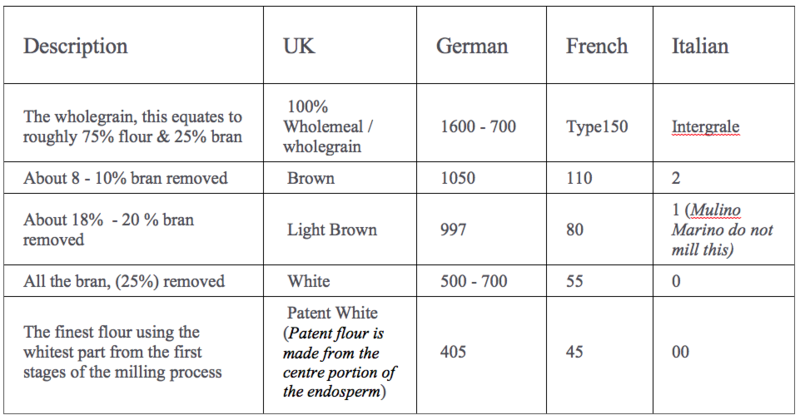 The protein and the gluten content of the 00 flours are higher than the typo 0, because of the blend of wheats used. The type 0 flour has higher levels of gliadin, resulting in more extensible doughs, the type 00 needs to be worked more. These two types of flour are highly refined, roller milled white flours. The type 0 flour is good for making loaves with a good rise, and requires slightly less time for proving. Whereas, the 00 flours are the ones to choose for ciabatta as they are finer. The Gluten varies for each flour, from high Manitoba to mid range, and this is fully documented the nutritional breakdown on the main Mulino Marino website. The gluten percentage is actually written as an overall protein percentage, whereas UK flour is listed as usable gluten, so it is generally about 1 – 1.5% higher that what you would find on the side of a bag of UK flour. So really my advice his the play and explore, and discover, it’s well worth trying some Italian flour to make sourdough with. Share the post "Using Italian Flour in Sourdough"
I use Mulino Marino flours since 2013 and my humble opinion is that they are one of the best mills in Italy. My favorite flour from Mulino Marino is ENKIR (Einkorn – Triticum monococcum ) with which I made sourdoughbread and cakes. I would like to try to make your festive Christmas cake, with einkorn, where can I find the recipe?